Apple is no stranger to abandoning features it thinks are heading for the graveyard of technology. I guess you could say the company invented it. The new iMac without a built-in optical drive is the perfect epitome of such forward-thinking that, however, isn’t without its pitfalls. With the revamped all-in-one desktop, club Cupertino risks alienating the old-fashioned types by inconveniencing their daily computing, at least until the rest of the industry catches up. Then again, every Apple customer has always been an early adopter in every sense of the word. The question is, will other makers follow suit and remove rotating medias from their products? 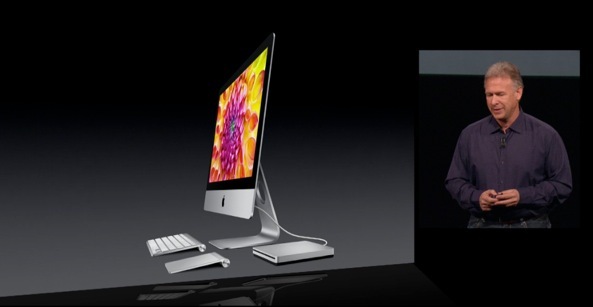 More importantly, what exactly does the new iMac tell us about a Tim Cook Apple? 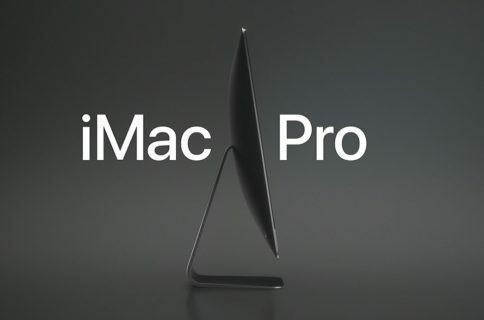 “What’s up with this new iMac dropping the optical drive?”, a friend of mine asked me nervously the other day. I could sense a nervous tone in his voice. My friend is a system integrator at a large IT solutions provider and deals with demanding clients on a daily basis, catering to their every whim. The problem is, his customers don’t deal with app stores at all and instead rely on software distributed on optical media. Nevermind that I tried explaining that users can easily ‘borrow’ an optical drive wirelessly from another machine on the occasional necessity. It’s not like Apple has provided no means to access optical media. When was the last time you needed a CD/DVD drive on your iMac? I understand that not everyone lives on the bleeding edge of technology, but Apple couldn’t care less about folks stuck in the old days. 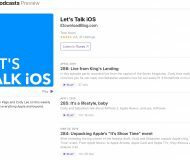 Apple’s Phil Schiller says that “in general, it’s a good idea to remove these rotating medias” because they are bulky and use power. Such an engineering decision helps the company “create products that are smaller, lighter and consume less power”. 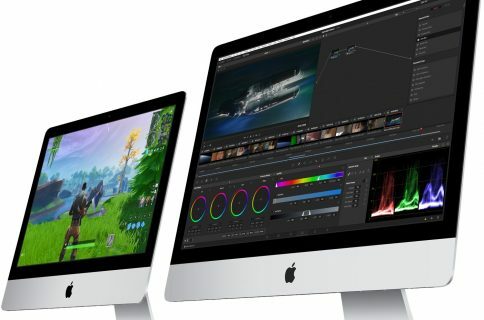 If you still deal with optical media, Apple will happily sell you a SuperDrive for your brand spanking new iMac, but it’s not like the company is forcing you to buy one from them. The writing has been on the wall for some time for a CD/DVD-less iMac. Apple famously has a history of moving technologies on their descendant out of their way to make room for the new. Just take a step back into perspective and look at what Apple has done thus far as a whole. 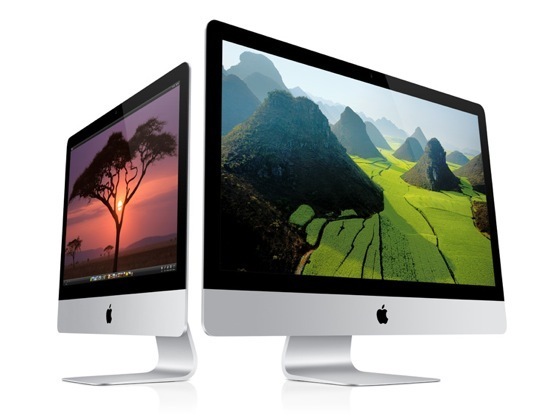 The iMac was introduced in 1998 as the first all-in-one Macintosh to have a USB port but no floppy disc drive. Subsequently, all Macs have included USB though never again would the company design another Mac with an awkwardly unreliable floppy drive. PC makers, of course, had continued to churn out desktops with floppy drives for years to come. And as unbelievable as it is, some of them still do to this date. Back in Cupertino, Apple has been steadily removing older peripheral interfaces from the rest of its product line. So, if Apple had the balls to market the first legacy-free PC at a time when the company itself was on a brink of bankruptcy, is it really so difficult to comprehend that Apple in 2012 markets an iMac without a built-in CD/DVD drive? Apple started abandoning rotating medias with a 2009 revision to the Mac mini server, which came without an optical drive, but contained a second hard drive in its place. 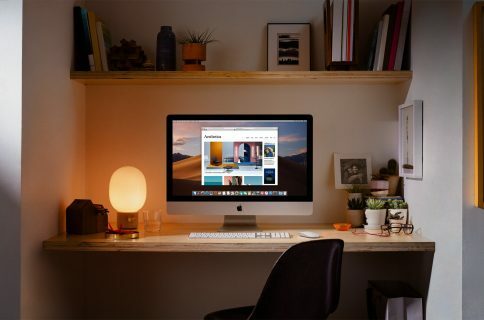 Then, on June 15, 2010, Apple dropped a built-in optical drive from all versions of the Mac mini to introduce other perks in place of it, like a Thunderbolt port. Haters had a field day accusing Apple of not supporting Flash on the iPhone because the company presumably saw it as a threat to native apps on the App Store. Who’s supporting Flash on mobile now? Certainly not Adobe, that’s for sure! It’s okay if you don’t remember Flash. 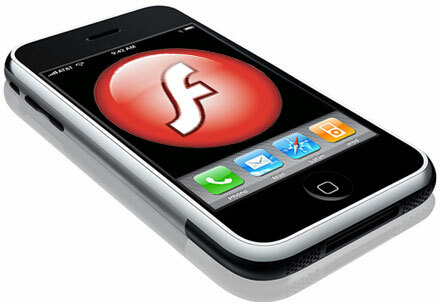 Flash on mobile devices was going nowhere yet only Apple had the courage to call it what it was – a dying technology. Adobe and the rest of the industry responded with an outlandish anger, slamming Apple for the perceived control freakishness. Phone makers heavily advertised Flash as one of the key differentiating features of Android devices over the iPhone. The media had a common enemy to write about. Everybody and their mother orgasmically enjoyed criticizing Apple. Countless words have been written about goddamn Apple and its Flash crusade. In reality, the company didn’t want to support this resource hog of a technology on mobile devices where battery performance is paramount. 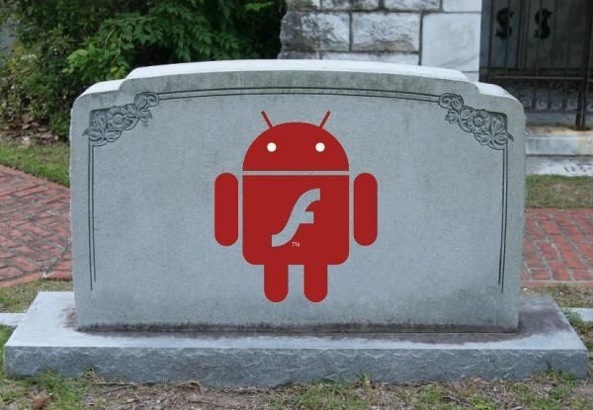 Apple took it all on the chin and had been right all along: eventually, Flash on mobile died a slow death. Nobody shed a tear, but only Apple was courageous enough to go against powerful vested interests and risk a short-term public outcry for the benefit of articulating how the rest of the industry felt about Flash anyway. But it’s not just other people’s technologies. Apple developed FireWire as a high-speed interconnect interface in 1995. 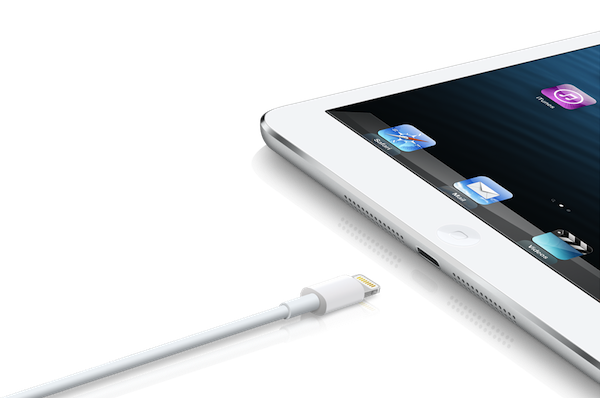 FireWire had originally been deployed across iPods, but was phased out in 2008 in favor for standard USB interface. 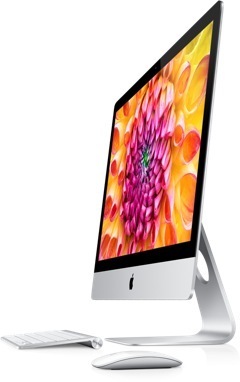 And now, the new iMac reaffirms Apple’s intention to continue leaving legacy technologies behind. 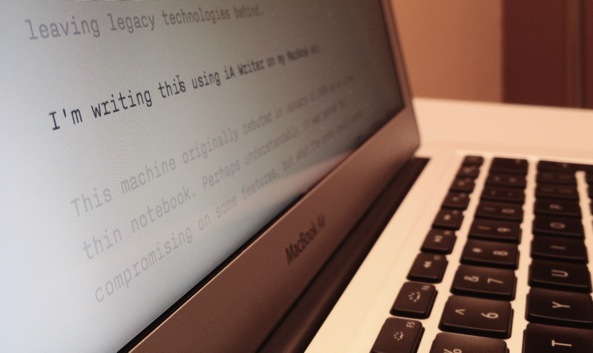 As you can see, I’m writing this using iA Writer on my MacBook Air. 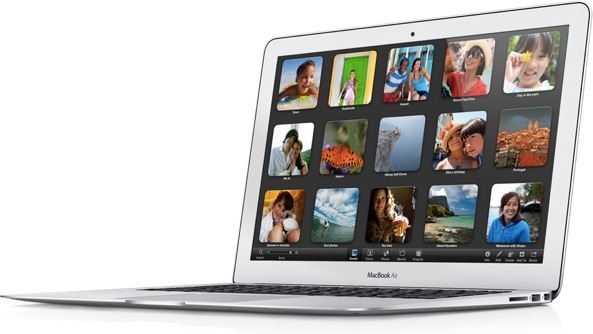 This machine originally debuted in January of 2008 as an ultra-thin notebook. Perhaps understandably, it was panned for compromising on some features, but what the press really zeroed in on was its lack of a built-in optical drive. Hell broke loose, headlines screamed at the time. If there ever was such a thing as a heresy in the computer world, there it was: an Apple notebook without an optical drive. But the heresy of one age easily becomes the orthodoxy of the next, as Helen Keller wrote in her 1903 essay “Optimism”. Nowadays, we have Ultrabooks. And guess what? You’d be hard-pressed to find one with an optical drive. And what an irony it is that even now many Ultrabook makers are still struggling to match the portability, extremely low weight and thinness of the Air. That’s because PC makers didn’t have the guts to advance their designs by dropping rotating discs altogether at a time when optical discs were deemed a standard feature. Something had to give: portability or optical media. 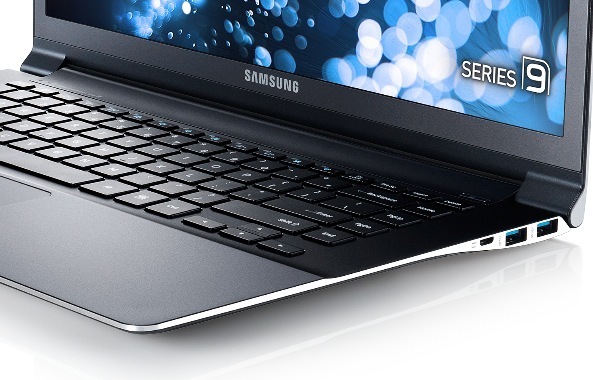 The industry followed Apple’s example and figured it needed to remove built-in CD/DVD drives to enable thin notebook designs, such as this Series 9 Ultrabook from Samsung. And when Apple in October 2010 removed a hard drive from the Air to focus on all-flash storage, it became very clear to me it saw rotating medias a nuisance of sorts, something in a need of phasing out ASAP for the greater good. Greater good being truly portable devices. That same year, the iPhone 4 debuted and went on to sell like gangbusters. And earlier in January, Apple launched the iPad. I can vividly remember the late Steve Jobs beginning his presentation by comparing Apple’s revenue to the likes of Sony and Nokia. “Apple is the largest mobile devices company in the world now – it’s amazing!”, he enthusiastically remarked. Jobs explained that most of Apple’s revenue came from mobile devices: iPod music players, the iPhone lineup and MacBooks, which are also mobile devices. Today, more than half Apple’s revenue comes from its phone alone so really it is an iPhone company. If Apple sees itself as a mobile devices company, why would they bother ever catering to audiences who are married to legacy technologies? Sure, there will always be people who insist on an all-in-one desktop that has an optical drive. And there will always be Dells and HPs of this world to meet their expectations. 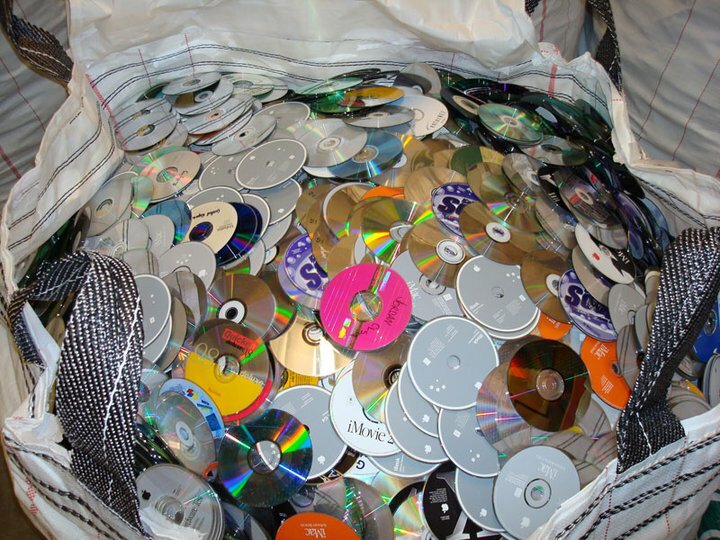 I got rid of all my optical discs years ago and never looked back. Do we really need optical media inside our computers at a time when physical media is dying and software gets purchased and delivered via the Interwebs? Boy did it feel good to dispose of all those CD/DVDs that have been taking space and collecting dust on my shelves. It was one less thing to worry about, a revelation of sorts. It wasn’t just the immediacy of the realization that cloud computing and digital delivery was the future – everyday consumers could easily see where the world was heading. It was the right thing to do. In my view, the sooner I freed myself from the baggage of the past, the better. I can’t recall a time when I burned a DVD or had anyone send me anything on a physical media. When Blu-ray came along, I felt the industry was pushing me to re-purchase my standard-definition DVD movie collection. Unsure about the stickiness of the new and expensive HD movie format and whether it would be supplanted by a new thing years later, I didn’t budge. Blu-ray movies, you say… Sure, love the image quality and the crispness of high-bandwidth compression. If I want to watch an HD movie on a Blu-ray disc, that’s what my PlayStation 3 is for. Plus, dedicated Blu-ray players can be now had for less than $100. I was perfectly happy moving my files around wirelessly and getting my entertainment digitally. It’s always been in Apple’s DNA that us, the consumers, have given it a blank check to do what’s necessary in order to create the best computing experience possible. The modern MacBook Air could never be so thin and light and portable if it didn’t abandon spinning platters and optical discs. With a built-in DVD drive, the Air would have been just another boring Ultrabook. The iPhone design wouldn’t have been possible without its sealed battery. The iPhone 5 could never be so thin and light unless Apple killed the bulky 30-pin connector to make room for other components, the $1+ billion accessory industry be damned. And now, the ultimate all-in-one could never have the 5mm edge and 40 percent less volume if Apple didn’t have the guts to drop the optical drive. Apple’s way, of course, doesn’t always resonate well with a certain portion of its user base. But it’s always been Apple’s way or the highway. Apple didn’t just start replacing a decade-old 30-pin dock connector from iOS devices to screw us: they needed a way smaller interface to cram electronics inside less volume. For most part, the consumers willfully live with the inconveniences along the way and endure bumps on the road. We have grown to accept that Apple is a company that doesn’t favor products which carry baggage from the past. Such an attitude is the most important pre-requisite to successful gadget making. In Apple’s example, it yields us the results that make our heart sing, as Jobs put it. Now, I’m first to admit that the Internet still isn’t the definite solution: broadband speeds vary wildly across the globe, bandwidth caps spoil the fun and so forth. But as imperfect as it’s always been, the Internet has proven itself to be perfectly capable for transferring small files. To move large chunks of data around, users can always resort to inexpensive and widely available USB thumb drives, external HDDs, NAS and what not. As for iCloud, it’s far from perfect, but even though Apple only dipped its toes into cloud computing, it’ll get there sooner than later. And, as some of you pointed out down in the comments, the question is really not if the optical drives are dead or not. It’s rather on whether they should be built-in or not. Apple obviously thinks that most of its users don’t need an optical drive on a day-to-day basis. You may disagree with Apple and lambast it for abandoning legacy technologies, but that’s how the company rolls. Welcome to the post-PC world: either embrace it or get left behind. I’m curious to learn where you stand on the subject.